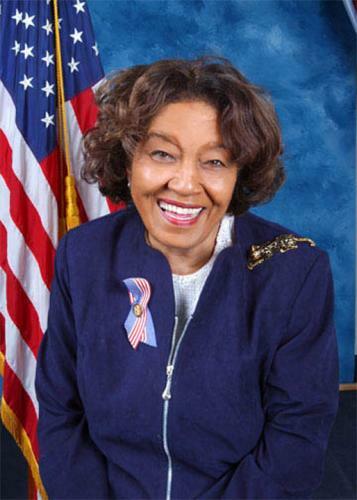 Julia May Porter Carson, one of the first African American women to represent Indiana in Congress, was born Julia May Porter on July 8, 1938. She was born in Louisville, Kentucky, but in her early childhood she moved with her mother to Indianapolis, Indiana, where Carson would spend the remainder of her life. Porter’s single mother, Velma, worked as a domestic and Julia as a child worked part-time waiting tables, delivering newspapers, and harvesting crops to supplement the family income. In Indianapolis, Carson attended Crispus Attucks High School, at the time a segregated school, along with future basketball star Oscar Robertson. She later studied at Martin’s University in Indiana, and attended Indiana University in Bloomington. Married early in life, Carson and her husband divorced leaving her to raise two children as a single mother. In 1965 Carson left college to work as a secretary for the United Auto Workers but switched career paths in the 1960s when newly elected Indiana Representative Andrew Jacobs, Jr., hired her to work in his office. This would prove a fateful career move as in 1972 Jacobs encouraged Carson to run for the Indiana legislature. She won the campaign and held her first elective office. Carson served in the Indiana House of Representatives between 1973 and 1977. By 1976 she was appointed assistant minority caucus chair. In 1977 she won a State Senate seat which she held until 1996. When Congressman Jacobs retired in 1996, he urged Carson to run for his old seat. Most observers felt she could not win in a predominately white, conservative-leaning district. She proved the observers wrong, winning 53% of the vote over Republican Virginia Blankenbaker. Carson underwent heart surgery after her election and was sworn into Congress from her hospital bed. During her time as a Congresswoman, Carson championed children’s issues, women’s rights, and efforts to reduce homelessness. She also authored a 1999 law which authorized a Congressional Gold Medal for Rosa Parks. Carson was a staunch opponent of the war in Iraq, condemning it as a venture driven by greed. Health problems plagued Carson throughout her career. She suffered for years with high blood pressure, asthma, and diabetes. She spent the week before the 2004 elections in hospital. On November 25, 2007 Carson revealed she had terminal cancer. She died in Indianapolis on the 15th of December, 2007.